What comes out of your mouth when you do not get your way reveals your theology of suffering and theology of God, which shows your Christian maturity. Jesus was correct when He said that what comes out of our mouths explains what is happening in our hearts (Luke 6:45). The Interstate is a parking lot. Biff is in a traffic jam, and his Executive Board is waiting for him to start the meeting. He will be late. Mable is over at her neighbor’s house slandering her husband. Many appeals for him to change has fallen on deaf ears. Marge cried herself to sleep last night. Again. She says it’s because of her battling parents. She has lost hope that they will ever change. What about you? How do you respond to trials? My question is not about being tried, but how do you react during those times when trouble comes and stays. To be discomforted in life is as assured as death and taxes. There are some things you can count on, and personal suffering is one of those things. It is part of the package that comes with the gift of life (Philippians 1:29). Because suffering is guaranteed, it’s essential to give reflective thought on how to respond when you don’t get your way—when disappointment comes knocking. If you listen to what I say, you will know who I am. Even though you cannot see my heart, you can discern my heart by what comes out of my mouth, and nothing will give you more clarity about my heart than in those moments when I do not get my way. During seasons of personal comfort and self-control, I can fake you out because there are no challenges or disruptions to my desires. It is during times when I do not get my way while being discomforted, that you will realize my practical theology. Granting – God grants us the gift of faith. Accessing – Because of the faith that the Lord provides, we have access to God’s grace. 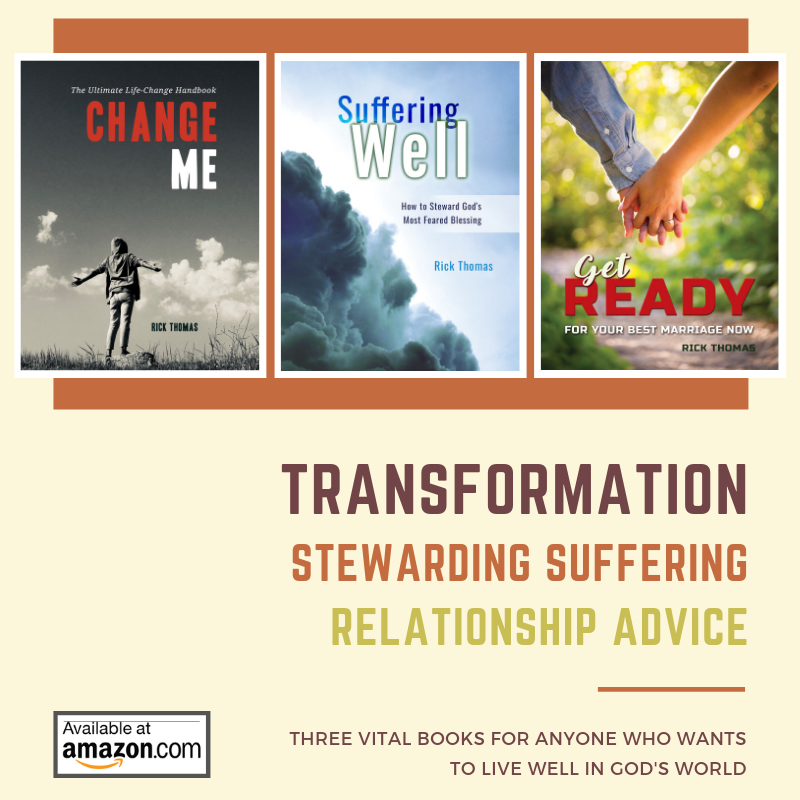 Enabling – It is God’s grace that allows us to interact with personal suffering. Producing – Personal suffering produces endurance, character, and hope. How are you living in the grace that God is providing you? Your response to suffering reveals the answer to my question. Difficulties do not necessarily have a purpose in themselves. Suffering is suffering. Everybody suffers. Even the unregenerate world suffers. They become sick and die. They are in traffic accidents. They divorce just like the Christian community. The difference between the unregenerate person who suffers and the believer who suffers is God. Though our lost friends experience the realities of suffering, none of them find faith, grace, endurance, character, and hope. Christians are the only ones who can experience God through suffering because they have a relationship with Him and they understand that He is working in their adverse circumstances. It is God who is producing Christ in our lives through suffering. Suffering does not produce divine character qualities. If that were true, the lost person would mature through suffering like a Christian. It is God working through our adversity, bringing out His good purposes in our lives. In the three illustrations, Biff, Mable, and Marge have two options. (1) They can either fixate on their problems or (2) they can center their thoughts on God, who is seeking to form Christ in them by the difficulties they are experiencing. The words you choose to talk about your problems will provide the information you need to understand the extent to which you need to calibrate your heart. The God-centered heart produces God-centered language according to the model that Paul lays out in Romans 5:3-5. This kind of person talks about his problems as one who is enduring through his issues—a person who is fortified even though suffering persists. The character of Christ, which can be understood by the fruit of the Spirit, will be evident to others through your speech patterns. Those things will reveal the hope you have in God, as He steadies you through the storms of life, but if you are like me, you’re not at that place in your pursuit of Christlike maturity. And if you are like me, here are a few helpful questions for you to discuss with the Lord and your friends. When you talk about your problems, what do you sound like most of the time: problem-centered or God-centered? Do you know the difference? Will you discuss your answers with a close friend? Christ died on a Roman cross. Let that sink in for a while. Living in a first world culture can dupe you into believing that life is supposed to go according to all your desires. This problem is where a sound theology of suffering is essential to living well in God’s world. When we align ourselves to God’s work in our lives, we are actively participating in His grace story: He is working in you to produce the fruit of the Spirit. God will not give you the life that you desire. He will provide you with the experience that you need to produce the good that He wants for you. This truth is just one of the many ways in which the gospel should practically function in your life. The longer you resist the good that He is seeking to produce in your life, the way He wants to provide it, the longer it will take you to experience the God of all comfort and the Father of mercies. Your goal should not primarily be how to overcome your troubles. Your goal is to be comforted in your suffering, by the comfort that God provides so you can comfort others. If your primary goal is to remove your suffering, you will more than likely live a miserable life. Life is not about “getting rid of your suffering” as though that is the chief aim for our lives (1 Corinthians 10:31). That is myopic thinking that is foolish, futile and misses out on the good work that God is doing in your life. Problem-centered thinking is a mindset that never sees God. The God-centered person approaches suffering from the expectation that God is working good in his life. He is patiently enduring, growing in character while living in hope. Are you enduring under the weight of your trouble? How is the character of Christ being formed in you? Are you more hope-filled than hopeless? The God-centered Christian is maturing through the suffering because of what God is producing in him. He can do what he could not do before, which is to comfort others with the same comfort in which he has experienced comfort from God. Do you want to be a discipler for Christ? We were saved to glorify God by sharing His message of hope to as many people as possible. We are called to help others know and experience God in the way in which we have experienced Him (John 4:29; 2 Corinthians 1:3-7). Because of the fall of Adam and the subsequent curse of suffering, we live in a world of hurting people. That is why it is essential for all of us not only to understand suffering but to live in the grace that God provides. I understand that God is good and that He is working good into every minute of my life regardless of what those minutes are like to me. I am empowered to live in the grace of God even in my harshest struggles. I am living in His goodness because I can endure even though the struggles in my life are not changing. I am now able to be a disciple-maker, helping those who need the comfort that God has used to comfort me. The call of God is not just about you feeling better or even getting over your problems. The purpose of knowing God is to be used by God. When you suffer, the question is not why me, but who else is struggling and how can I help them? That is the question that God wants us to answer during our times of suffering. That is how Paul understood his adversity in 2 Corinthians 1:3-7. God wants our holiness to be more important to us than our definition of happiness, which is why He is producing Christ in us through the crucible of suffering so we will be empowered or enabled to help others. In addition to the questions that I have sprinkled throughout this article, here are a few more for your consideration, mainly: how are you stewarding your trials, sufferings, adversities, and disappointments? What is God doing through your pain? What are the useful purposes that He is producing in your life? How are you comforting others through God’s work in your life? Only when you see suffering as purposeful, will you be able to see suffering as powerful. Where is your focus in your times of adversity? 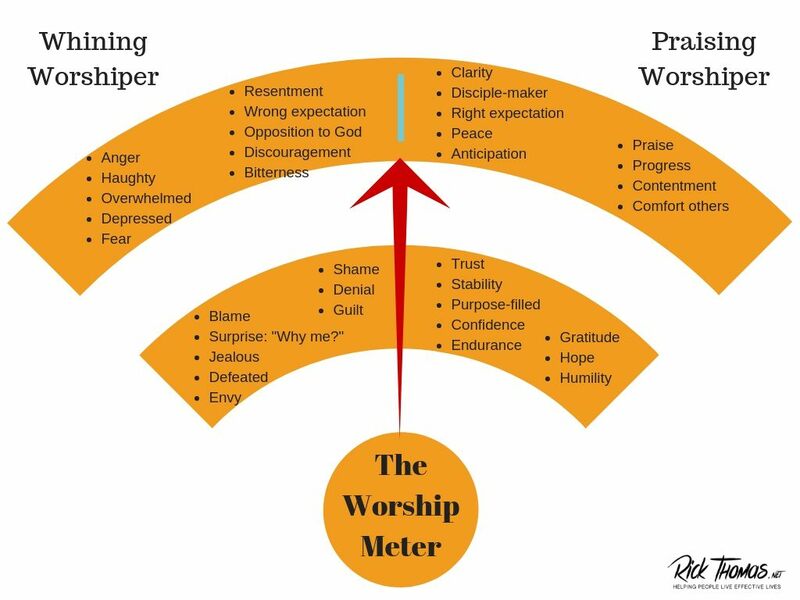 With these things in mind, I have produced a “worship meter infographic” that comprises some of our more common responses to personal suffering, trouble, and life’s inconveniences. I have divided the worship meter into two parts. My worship of God is more about whining when I don’t get what I want. My worship of God is more about praising when I don’t get what I want. Below is my list of some of the things that you see in the worship meter. I did not list them in any order of priority but separated them into two distinct camps. As you read the list or look at the worship meter, how are you generally characterized when trouble comes into your life? Where does the “red needle” land? Are you more of a whining worshiper or a praising worshiper? Will you ask the Father to help you wrestle through and apply the truths in this article? Will you take these thoughts to a small group of friends for more in-depth discussion? « If You Exported One Thing To Your Child, What Would It Be?